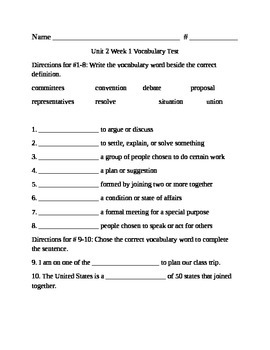 This is a vocabulary test I made that aligns with McGraw Hill Wonders Fifth Grade Unit 2 Week 1. It has eight vocabulary definitions and the word should be matched to the correct definition. It also has two sentences where the vocabulary word that best fits in the sentence should be used. An answer key is also included.